for $399,000 with 2 bedrooms and 2 full baths. This 1,140 square foot condo was built in 1980. ENJOY THE WONDERFUL AMELIA LIFESTYLE! Open floor plan with expansive ocean views from all living areas, amazing sunrise views. Walk out your large patio right to the beach. Large master Bedroom suite allows you to never miss another beautiful sunrise. Guest bedroom and a second bath will have your guests living in paradise too. Unit is fully furnished and is turn key for the new owner. Atlantis amenities include gorgeous outdoor sun deck, pool, tennis courts, and private beach access! 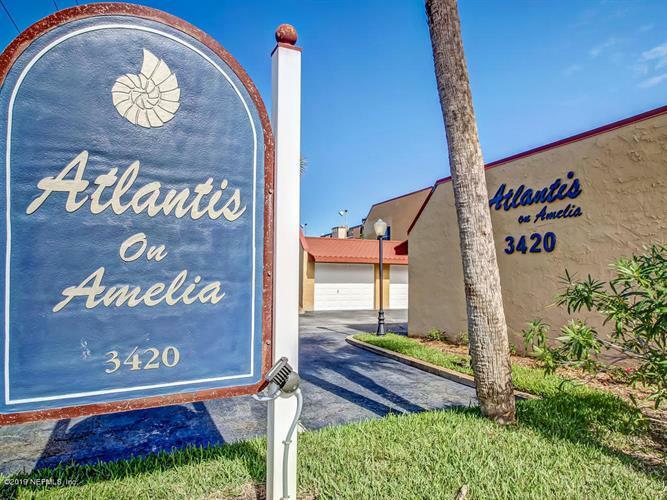 Only 24 units in this the popular condo; Atlantis allows for short-term rentals - which gives you a great investment - & your own GETAWAY on Amelia Island! Conveniently to restaurants and shopping. EASY access, drive up and park within 20 of your front door, no stairs to climb! LOW MAINTENANCE.